View of Earthlings, 2017. Photo: John Dean. Organized by Shary Boyle at the invitation of Esker Foundation. We are of the earth and from the stars, cooked mud and pigmented wax, soot and soda, ink, wood, tobacco, fur, fire, bronze, and acrylic nails—mortal inhabitants of the earth dreaming of our spiritual or extraterrestrial foil. 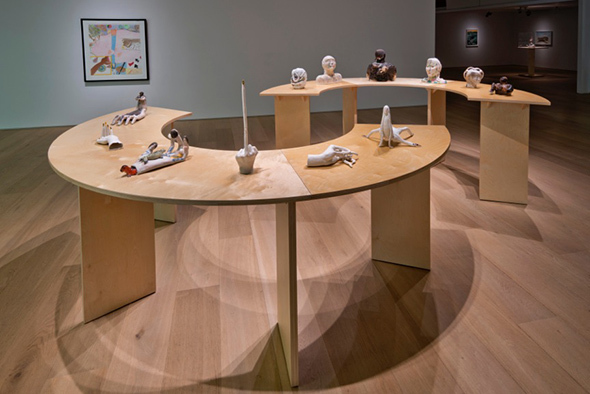 Drawn from this framework of earthly conditions, the visionary ceramics and works on paper of Earthlings, produced both individually and collaboratively by seven contemporary artists, are at once transformative and otherworldly—and profoundly human. Though making work from distinct cultural and geographical positions—from Kangiqliniq/Rankin Inlet, Kinngait/Cape Dorset, Qamani’tuaq/Baker Lake, and Toronto—the artists in Earthlings share an intuitive and labour-intensive approach to materials and narrative imagery. In these works, detailed figures are subject to transformations and transmogrifications, hybrid blendings of animal and human, reality and myth, and actual and imagined spaces. These pieces seem to emerge from phantasmagorical worlds, simultaneously fleshly and physical, sensual and spiritual, alien and familiar. Roger Aksadjuak’s work can be found in many public and private collections across North America, including the Winnipeg Art Gallery. Shuvinai Ashoona is a Cape Dorset artist whose work is in numerous collections of major art institutions, including the Art Gallery of Ontario, Toronto, Canadian Museum of History, Gatineau, National Gallery of Canada, Ottawa, and the Winnipeg Art Gallery. Pierre Aupilardjuk’s work is included in the collection of the Prince of Wales Northern Heritage Center, Yellowknife, the permanent collection of the National Gallery of Canada, Ottawa; and in private collections throughout North America. Shary Boyle works across diverse media, including sculpture, drawing, and performance. In 2015 she performed at Luminato Festival, Toronto, and the National Gallery of Canada, Ottawa, created a commissioned sculpture for the Musée des beaux-arts de Montreal, and presented Universal Cobra with artist Shuvinai Ashoona at Pierre-François Ouellette art contemporain, Montreal. She represented Canada at the Venice Biennale in 2013. Jessie Kenalogak works primarily in drawing, her most meaningful artistic influences coming from her grandfather Angushadluk, one of the most important and respected artists ever to work in Baker Lake, and her aunt, Mary Singaqti, another highly respected Baker Lake artist. John Kurok is one of a new group of younger Rankin Inlet ceramicists who also work as printmakers. Kurok’s work is included in the permanent collections of the National Gallery of Canada, Ottawa, and the Museum of Inuit Art, Toronto. Born in the early 1960s, Leo Napayok spent most of his time growing up in the towns of Salliq (Coral Harbour) and Kangiqliniq (Rankin Inlet). He works as a carver in soapstone, ivory, and antler and has long been established as one of the region’s most talented carvers. His collaborative works have since become a part of the permanent collection of the National Gallery of Canada, Ottawa. The artists would like to thank the Canada Council for the Arts, Dorset Fine Arts, Feheley Fine Arts, Inuit Art Foundation, Matchbox Gallery, Medalta, Nunavut Development Corporation, Nunavut Arts and Crafts Association, Jim and Sue Shirley, and Marnie and Karen Schreiber. Estranged Setting presents two sculptures in an immersive painted environment. The works, Bird Factory (2016) and Trawl (2015), depict shifting anatomies that embody the complexities of contemporary consumption, industrial fishing, and agriculture. In Bird Factory, poultry populate a structure whose appearance hovers between that of a chicken’s body and an industrial farming complex. Cartoonish at a glance, the work plays with pop representations of the animal as a façade for the darker nature of its life within the food production system. In Trawl, an overburdened fishing net assumes the shape of a human body, with the boat dragging the net taking the place of the figure’s head. The work is a modern update of Arcimboldo’s Mannerist painting, The Ocean (1566), an anthropomorphic celebration of marine bounty. In Estranged Setting, bodies, food, and production methods merge in reflective and critical cycles. Jude Griebel creates sculptures of hybrid bodies, whose anatomy is merged with their surroundings. These figures are compromised by situations of consumption, excess, and disregard, played out on their dioramic surfaces. In these works, he is not so much interested in how waste is generated, but rather how we re-digest popular images of accumulation and environmental degradation, weaving them into the fabric of our subconscious. His work has recently been presented at Galerie Sturm, Nuremberg; the Redpath Museum, Montreal; and in Future Station: The 2015 Alberta Biennial of Contemporary Art, Art Gallery of Alberta, Edmonton. Griebel was a 2015 artist-in-residence at HALLE 14 – Center for Contemporary Art, Leipzig, and was awarded the inaugural Alberta Foundation for the Arts residency at the International Studio and Curatorial Program in Brooklyn. He is two-time recipient of the Elizabeth Greenshields Foundation grant for emerging artists.